The Minnesota Grown Program is a statewide partnership between the Minnesota Department of Agriculture and Minnesota producers of specialty crops and livestock. It was created nearly 30 years ago by specialty crop growers to differentiate their produce from produce grown thousands of miles away. Danielle's love for the outdoors includes activities like camping, horse riding, and - of course! - finding fresh, local produce. She enjoys discovering new farmers markets, meeting the growers, and bringing home unique finds to try new recipes. As Marketing & External Relations Coordinator, Danielle connects customers with local producers throughout Minnesota by engaging with them on social media, the Minnesota Grown website, and through other media partnerships. She brings a strong digital marketing background and proven experience growing community relationships for experience-based organizations, including the Water Park of America and the National Eagle Center. Danielle graduated from the University of Minnesota – Twin Cities, Carlson School of Management, with a BSB in Marketing. Karen has a long-standing love of food and agriculture and grew up on a family farm in Iowa. Previous to working with Minnesota Grown, Karen worked on food systems projects within U of M Extension. In her free time, Karen enjoys traveling, gardening, reading, and cooking. As Member Services Coordinator, Karen is responsible for managing updates to the Minnesota Grown Directory and Wholesale Directory, connecting to and recruiting new Minnesota Grown members, and sharing information about Minnesota Grown at public events and trade shows. Sarah has a passion for food and agriculture that stemmed from her childhood in southeastern Minnesota where she grew up on a small apple orchard. Much of her youth was spent outside camping, hiking, cooking, gardening with her parents, and taking road trips around the United States. Additionally, growing up in an agricultural community helped her gain an appreciation for the work that farmers do and the benefits of a strong local food system. Today, Sarah attends Macalester College in St. Paul where she studies environmental studies with an emphasis in food systems. She is also pursuing a minor in Latin American studies. As the student worker for Minnesota Grown, Sarah helps Karen and Danielle fulfill promotional orders, stay in touch with members, and maintain marketing channels including social media, website, and newsletters. Minnesota Grown creates the annual Minnesota Grown Directory, which connects Minnesotans directly to farmers, farmers’ markets, and other producers. It also includes fun facts and family-friendly activity suggestions. Search through the Directory to find farmers markets, CSA farms, garden centers, wineries, fruit & vegetable growers, pick-your-own farms, livestock producers, meat processors, Christmas tree growers, and producers gourmet products like honey, wild rice, and cheese. The Directory is available in print and also online. The Directory is available statewide through travel information centers, libraries, chambers-of-commerce, Explore Minnesota Tourism, member producers’ farms, and at special events like the Minnesota State Fair. You may also order directories directly from us and they are shipped to you for FREE! 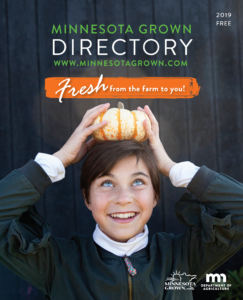 Click here to order your own copy of the Minnesota Grown Directory. The Minnesota Grown Program works hard to provide members with marketing tools and resources. For more information about member-services, click here to be directed to our members & retailers page.